A Corporate Retreat could be just what the doctor ordered. When done right, these retreats help boost morale and teach employees how to be more productive. All work and no play makes Jack…a really grumpy employee. And when morale is down across the company, productivity suffers. So, maybe it’s time to get out of the office and give your employees a break from the mental grind. A Corporate Retreat could be just what the doctor ordered. When done right– we aren’t talking all-inclusives or luxury spas – these retreats are a proven business tool that can help boost morale as well as teach your employees how to be more productive. Through a series of fun and creative team building activities, your employees are challenged to break down communication barriers and work together to solve certain problems. After each exercise, the participants and their facilitator discuss the lessons behind what they just did to help reinforce these ideals and ensure they make it back to the office. Still, there are several additional steps you can take as an employer to make sure your employees get the most out of your time together. Remember life before smartphones when people were forced to interact with one another? No one hid behind their cell phones unless they were playing a game of snake, but that only took a couple minutes. Facebook didn’t exist. Heck, Myspace didn’t even exist. Wasn’t life easier? Connecting to other human beings takes effort and actual human interaction, but it is an important part of building a strong business – strong teamwork. Therefore, if you want your corporate retreat to be a success, you should to disconnect from any and all electronic devices during your retreat. Let’s just hope your employees remember how to interact with other people without the help of Facebook. Remember, a corporate retreat is not a meeting, so do not treat it as such. Make the event special for your employees and be sure to build in some fun to go along with all of those business lessons you want to address. A retreat should be the perfect combination of fun and educational. It should be interactive. In 1938, John Dewey wrote that “there is an intimate and necessary relation between the processes of actual experience and education.” In layman’s terms, humans learn better by doing – by being hands-on. Throw in a little fun and you have a guaranteed recipe for success. In order for your corporate retreat to be meaningful, you have to pick a meaningful location. There is some real work to be done. So forget about those all-inclusive resorts and luxury spas. While those places may help boost morale for a time, the lasting effects will be minimal, if any. Despite its name, a corporate retreat isn’t a withdrawal or escape from work, but rather an opportunity to learn and grow as a team. 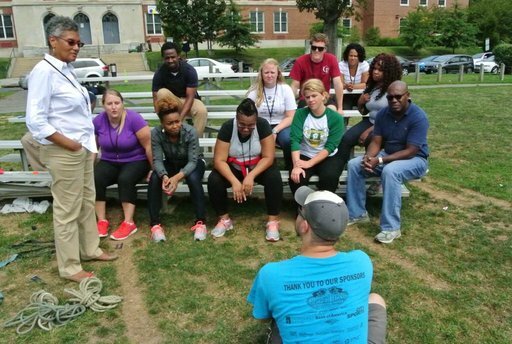 Conveniently located between Baltimore and Washington DC, Terrapin Adventures is uniquely suited to provide a Team Building solution for any company.We provide both on-site and off-site team building adventures designed to break down group barriers and help your staff work more efficiently and cohesively. Our years of experience in the corporate workplace allow us to apply the lessons we’ve learned to our Team Building Programs, in turn, achieving meaningful outcomes. Click Here to Schedule Your Corporate Retreat! If you have any questions about Planning a Corporate Retreat, please call Terrapin Adventures at 301.725.1313, or email us at info@terrapinadventures.com to learn more. You can also follow Terrapin Adventures on Facebook, Twitter, LinkedIn, YouTube, Google+, and Pinterest for up-to-date information on events, trends, and other fun and exciting outdoor activities. This entry was posted on Friday, September 11th, 2015 at 7:03 am. Both comments and pings are currently closed.